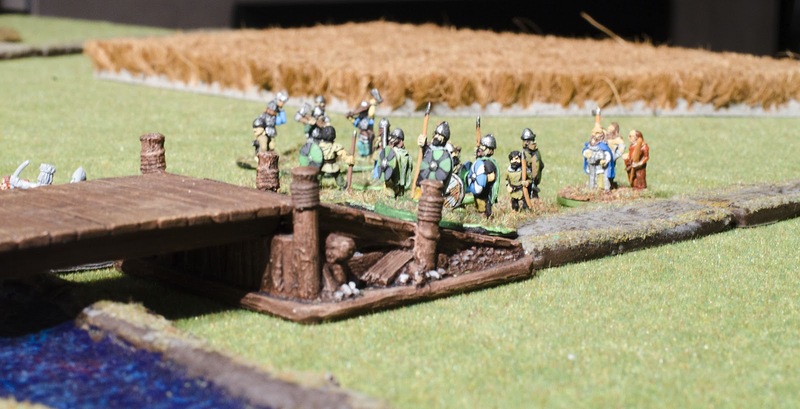 I finally managed to get my 15mm Picts onto the table on Friday. Bryan and I have been making big plans for playing both Saga and Dux Brittaniarum with the Dark Ages figures we've been working on, so it was good to see them blooded at last. I was in command of the Picts (using the Scots faction from Saga), while Bryan was in charge of the Anglo-Danes. We were "arguing" over a bridge and a ford that crossed a river. The starting dispositions - the majority of both forces set to contest the bridge on the right, with smaller detachments to attack the ford on the left. We both weighted our forces more heavily to the bridge side than the ford side, maybe because the bridge looked more impressive than the ford. 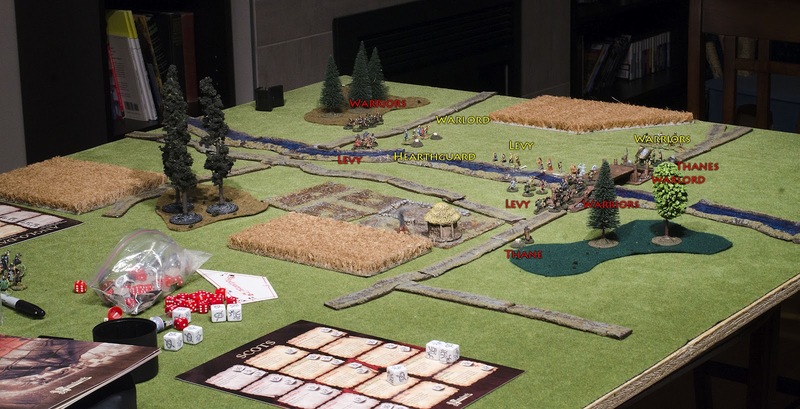 As it turned out, though, most of the decisive action was on the left, ford side. 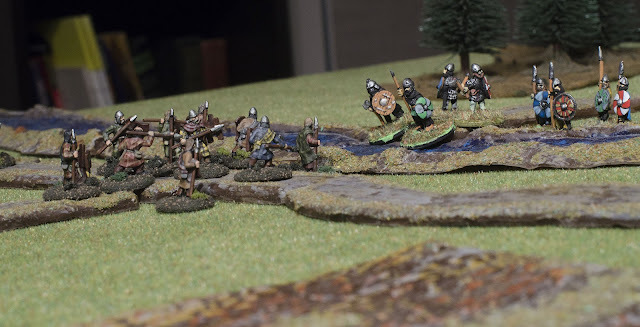 The Pict left flank, with a large group of warriors skulking Pictishly in the woods! 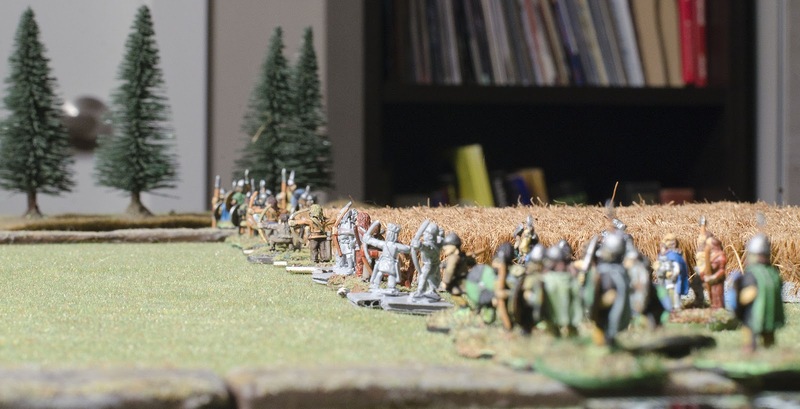 The Anglo-Danes attacked across the ford first, which set the tone for the whole fight. The Scots faction in Saga is fairly defensive, and they can do a lot more damage when attacked than when they are the attackers. My warriors killed half the Hearthguard without suffering any losses, and pushed them back across the river. More back-and-forth followed in the succeeding turns, with that group of warriors suffering very few casualties but inflicting a lot of pain on the Anglo-Danes. Anglo-Danish Hearthguard advance on the Left-flank ford, but are rebuffed by the Picts who catch them up to their waists in water. On the bridge side it went the other way; I got the first charge in with my Thanes, but they got pretty badly beat up. 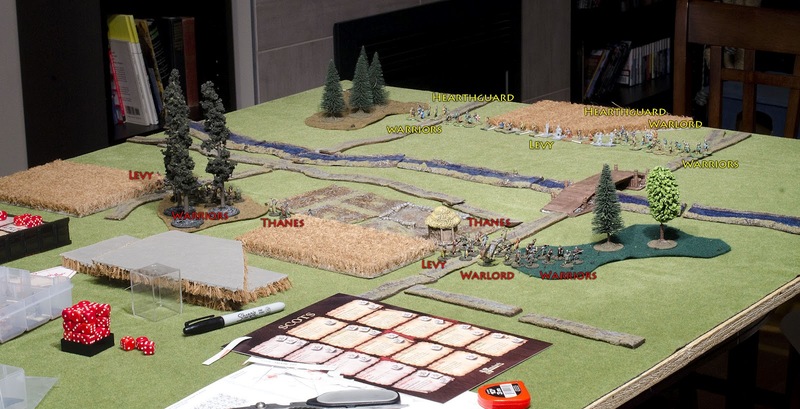 The one remaining Thane ran away and hid behind the woods so I didn't lose his unit, which would have reduced my dice pool. 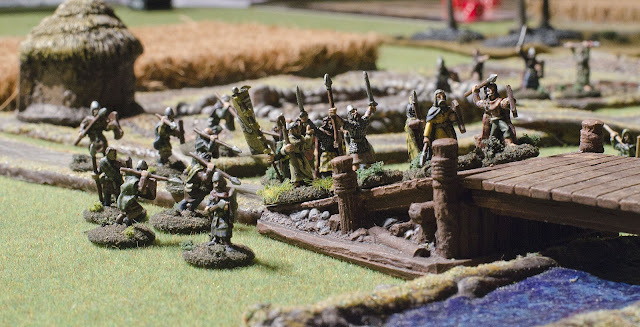 A lot more waffling occurred around the bridge until the final turns, when most of the Anglo-Dane manpower had been chewed up on the ford side and a crossing looked more possible. 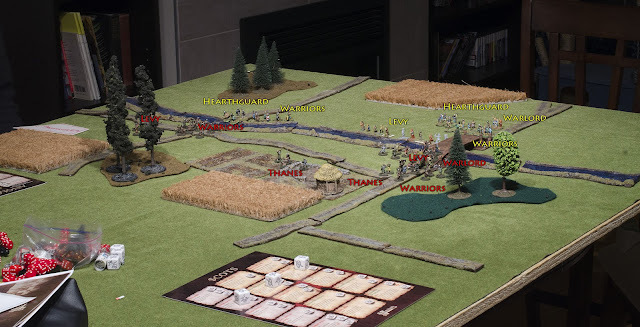 The Pict warlord advances onto the bridge on the right, surrounded by his Thanes. Anglo-Danes step forward to meet the Picts. At the end of the fight both of our armies were still on the field, but I had a bunch of Picts on the far side of the river, earning me victory points, while the Anglo-Danes had none on my side. My warlord declared Pictory and we all had a feast. Final dispositions: Pict Warriors and Levy across the river on the left, Thanes and Warlord across the bridge on right.